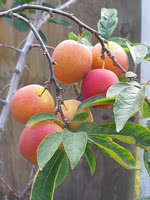 Pembina Plum is an upright tree great for backyards and rural areas. 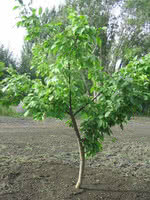 This hardy tree needs to be pollinated by a wild plum tree in order to produce high yields of fruit. 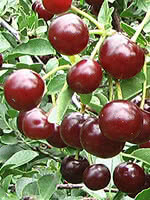 We recommend pairing Pembina with Patterson Pride Plum as these varieties cross pollinate well with each other. 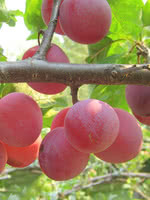 Pembina Plum's famously large fruit grows to over 2 inches with thick, acidic skin and sweet flesh. People love this fruit for fresh eating, baking, and preserving. Do not procrastinate collecting these plums. If left too long, the fruit will fall off the tree. 1 year old grafted seedlings. True to type and vigorous. Size: Leader has been pruned to fit in a 3 ft box.